Mocha just arrived from the Palm Beach Race Track. She only had two official races and fell in her first one and finished last in her second one. She was slow so was retired young. Mocha is a small girl that raced at 57lbs. She just turned 2 on December 1st. Her sire is Odd Skill and her dam is a girl that we placed named Rico's Tignanello. Mocha is actually being fostered with her mom. Mocha was pretty interested in the cats that she saw at the vet's office so her foster home will work with her with their cats to see if she can live with them. 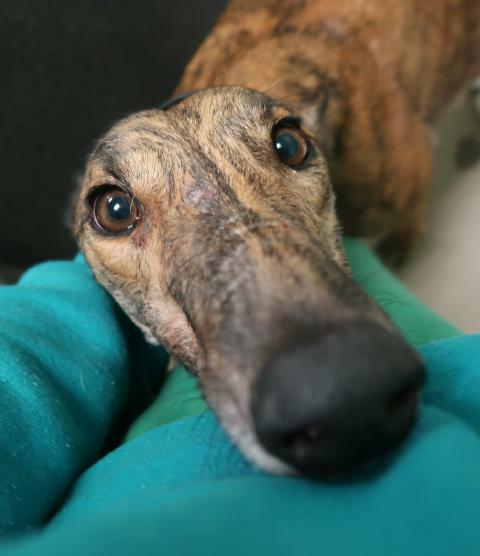 She is a happy, outgoing, bouncy girl that loves everyone she meets. Very sweet girl that traveled really well too. More as we get to know her.